In a sieve, wash quinoa under lukewarm water and transfer to a pot. Add water and salt, bring to a boil, and cook for approx. 20 min. Meanwhile wash and halve cherry tomatoes. Zest and juice lime. Cut chili into thin slices. Halve pomegranate and deseed. Remove quinoa from heat and allow to cool. Season with salt, pepper, some cayenne pepper, some lime juice, and honey to taste. Halve and peel avocado, remove the pit, transfer to a small bowl, and mash with a fork. Season with remaining lime juice and zest, remaining cayenne pepper, salt, and olive oil to taste. For the dressing, season buttermilk with salt, pepper, cumin, honey, and lime zest in a small bowl. Serve quinoa salad with guacamole and cherry tomatoes. 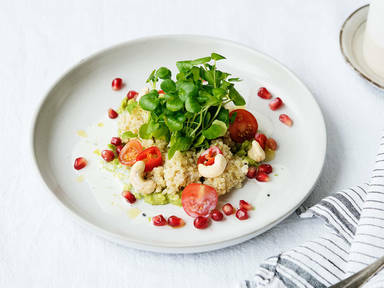 Top with pomegranate seeds and cashews, garnish with garden cress and chili. Drizzle with buttermilk-dressing and enjoy!